There was a time—not too long ago, even—when the Astro A50 was the de facto standard for wireless gaming headsets. It was attractive, had pretty great sound (for a gaming headset at least), good noise isolation, and intuitive controls. 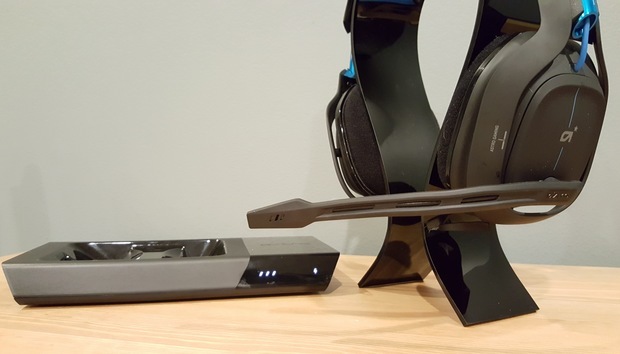 Add a built-in game/chat mixer, a feature we still don’t see on near enough headsets, and the A50 was an easy recommendation. But it’s been a long time since Astro did a proper A50 refresh, and the competition got fierce. Corsair’s put out budget-friendly $100 headsets for the last few years now and Logitech’s $170 G933 impressed us even more. In this new market, the A50’s $300 price point began to look anachronistic. Unearned. Silly, even. No longer—or, at least, not quite as much. The A50 is back for 2016, and brings with it a new premium presentation. Design-wise, the A50 plays twin to its predecessor. The ears and headband are soft-touch plastic, fairly lightweight, and joined by two exposed metal pipes with the cable casually coiled inside. It’s a showy design, a relic of the edgy gamer-centric ethos of the mid-2000s with its sharp angles and flashy highlights—and yet I still think the A50s are attractive, in their own way. They’re compact, sleek, and embrace Astro’s gaming pedigree while retaining a certain high-end (read: adult) look. The result is a bit more timeless than, say, the neon-hued extravagance of some of Razer’s early headsets. Put your old A50 and the new A50 next to each other and they look practically identical, aside from color. The A50 comes in two familiar color schemes for 2016: black and blue for Sony’s PS4, gray and green for Microsoft’s Xbox One. And if you plan to use the A50 with a PC? The choice is entirely irrelevant. I went black and blue, because I think the Xbox-themed version is ugly, but it’s your call. Both will work. The main changes to the headset are more subtle, and reside mostly with the built-in controls. Placement is similar—game/chat mixer on the right face, volume wheel and assorted buttons on the rear of the right cup. Astro’s done some tweaking though, changing the power button to a slider (a huge improvement on the previous A50’s miniscule on/off button) and adding a Dolby toggle above the three-way EQ slider. I also found myself leaving the A50 in a perpetual “On” state, thanks to a more invisible improvement: internal gyros. The previous A50 (and most wireless headsets) would automatically turn off if it didn’t detect any audio being played for a certain amount of time—say, five minutes. But the new A50 detects movement, so if you set the headset on a desk for 30 seconds it’ll automatically shut off. Lift it up and put it back on and by the time you’ve done that, it has probably paired back up with the base station and is ready to play audio again. It’s seamless, and probably my favorite feature about the new A50. I never have to fiddle with the power switch, never have to worry about whether it’s on and ready to go. It’s just always ready to go. It’s a small touch, but one that’s made the new A50 a go-to favorite since our review unit arrived and made my other wireless headsets seem archaic by comparison. And speaking of the base station...well, I guess it’s time to talk about the base station. That’s the other big change for this year’s A50: the inclusion of a hunk of plastic that’s part display stand, part information relay, part charger. With most wireless headsets transitioning to USB dongles in the last few years—see the G933 and Corsair’s Void Wireless for examples—Astro’s old A50 receiver was comically oversized. Measuring maybe four inches square, it was a massive bit of hardware with literally two buttons: Dolby On/Off and a redundant power switch. A total waste of space, made necessary only because Astro wanted to accommodate optical in/out and 3.5mm sources in addition to USB. The new A50 makes the base station an installation in its own right. At eight inches long, four inches wide, and an inch tall, this is a hefty piece of hardware to toss on your desk. But when you’re done with your A50? You simply drop it onto the base station and it starts charging—plus it looks pretty. It’s made the A50 experience even more frustration-free. I never worry about whether it’s charged, I never worry about where to place it. It goes on the stand, it’s charged all the time. I am a bit worried about the base station’s durability—those charging capabilities are governed by some fragile-feeling contacts sitting in the bottom—but it’s one of the most elegant charging solutions I’ve seen for a wireless headset, solving the “I just put these on and already the low-battery indicator is beeping” problem I had with the previous A50. Now, some issues. 1) Continuing in the Astro tradition, the base station comes with a ridiculously short three-foot USB cable. If you’re using a standing desk, good luck. Get a new cable. 2) Astro loves to tout its 5GHz transmitter, which is all well and good except for range and penetration. If I walk into the next room (10-15 feet), my A50 occasionally drops. I’ve also noticed occasional interference sitting at my desk, which is weird. 3) I had one instance where the A50 refused to stay on. Sitting in the base station? Fully charged and paired. Pull it off? Immediate shutdown. The solution (after contacting Astro) turned out to be a hard reset, holding down the Dolby and Game buttons for 15 seconds. This sorted the issue, but I still don’t know why it happened in the first place. And if there’s one place I think Astro should’ve put in more work, it’s the A50’s sound. Oh, it’s not bad per se. In fact, for a gaming headset the A50 is still pretty damn decent. “Why spend $300 on a gaming headset if you could get a great pair of headphones and a separate mic for the same cost?” has become a particularly strident refrain in the past few years though, and if we take that complaint at face value then Astro doesn’t have a great response in the A50. I think the sentiment is a bit overblown, personally—there’s something to be said for the convenience of a built-in microphone, let alone the chat/game mixer of the A50—but whether in games, music, or film, the A50 doesn’t sound significantly better than Logitech’s cheaper G933, and doesn’t come close to a $300 pair of headphones like, say, Audio-Technica’s ATH-M70X. What you get with 2016’s A50 is very similar to what you got with the previous A50—a moderately bass-boosted headset backed by clear-cutting mids and slightly less precision in the higher end of the spectrum. Gunshots sound crisp, for instance, but cymbal crashes often sound mushy regardless of what EQ settings you use, and distort at moderate volumes. It’s also worth noting that all three default EQ settings on the A50—even the “Studio” preset—supercharge the high-end to give it a crisper sound. Download Astro’s software, zero out the EQ, and you’ll better hear the A50’s weaknesses, namely that the highs are more muffled and the audio given less room to breathe than competing products. Anyone with talent can EQ an average headset to sound great. The hard part is making that the baseline. And honestly, we should expect the original, undoctored A50 to sound better for a $300 headset. As-is, it’s hard to say the A50 stands above the G933 on audio alone, though the base station/charging/comfort/what-have-you might still sway your opinion. Astro’s also been surpassed in terms of faux-7.1. Once a standout feature for Astro, I think the G933 does headset surround better than the A50. This is an academic distinction in some ways because I still think both are bad, giving even games coded for surround a sort-of hollow, floaty feel when stereo audio would serve just as well, but I mention it here for posterity. The microphone is the one aspect where Astro still shines. The new A50 microphone is more flexible than its predecessor, allowing for easy repositioning, and it’s clear as a bell even before you fiddle with Astro’s various noise gate settings. Other headset mics don’t even compare. In design, in presentation, in convenience, Astro’s new A50 finally delivers a compelling reason for fans to upgrade their old A50 headset. The charging station is an excellent (albeit ostentatious) bit of work, the motion-sensing auto-on/off is a genius development I hope shows up in other headsets, and the battery life is finally up to par with leading competitors. It’s just a shame the A50s don’t pack more of a punch where it matters, with audio that’s only suitable for a “high-end” gaming headset because we haven’t learned to demand better. At this price? A bit hard to swallow.